TEMA — An informal economy should be better known as the every-man-eats economy. It is the structure of economy that permits man to make a living with his bare hands and toes, off his own labor, to use his skills to the fullest of proportions. He needs no permission to use his skill. The use of his skill is by right, citizenship, and birth. It is a mark of true freedom. In an informal economy, any woman can sell food, clothes, fruits, nuts, vegetables. She requires no permission from anyone. Only the will, motivation, and drive. No one takes a percentage of her sales. The revenue she earns is solely for the individual, her family, and her community. It enables her to earn money, to live and eat. It enables the community the ability to survive and thrive. Every man in the informal economy has a chance to make a living on his own accord. The formal economy should be better known as the one-man-eats economy. One man sells food, clothes, fish, nuts, vegetables. The others can sell only if he gives them permission. The use of man’s skills are only by permission and privilege. The formal economy is a mark of absolute control by the one man. If a woman is chosen to sell, the one man always charges her a fee and takes a percentage of what she makes. If she does extremely well, the one man offers to buy her out. And what he calls an offer is really a demand. He will shut down her business otherwise—by hook or by crook. Everyone must comply with his rules. In the formal one-man-eats economy, one man decides who should eat alongside him. But this extension of food to some is not out of generosity. He is smart to know that someone else must eat too, though always less, in order for him to enjoy his gluttonous meals. In the formal economy, earning money, living, working, and eating are not unalienable rights of personhood, only privileges bestowed upon few and withheld from a majority. Imagine a woman who needs money to buy rice. And she has a fine skill—to create ornate hairstyles by braiding hair. In an informal economy, her decision is straightforward: She can invite people to her home and braid their hair in exchange for money or in exchange for rice itself. When people in her community like the work she performs for them (and they do because her talent is exquisite), they come back to request her services once more. Some recommend her services to other people they know. Easily and without hassle, she acquires the money to buy rice using her skills alone and nothing more. Now imagine this same woman in a formal economy. While she possesses the same skill to plait hair, she is not free to use her skill as she wishes. The formal economy lords itself over her talent. It erects speed bumps, detours, and road closings where there should be unencumbered paths. Using her talent is not guaranteed and is not without much unneeded friction. In order to braid hair, she has to satisfy the whims of the one man in charge of the one-man-eats economy. She is told that despite her talent, she cannot braid hair just yet, because in order to touch someone’s hair in exchange for money or rice, she first needs a license to do hair. She replies, I already have the skill, you see? You do like my hair, right? But she is told that is simply not the way it is done here in a formal economy. Here, you have to go through the one man in order to do anything. Here, braiding hair is not simply a skill passed down from grandmother to mother to child. In a formal economy, braiding hair is a profession. In order to perform the task in exchange for money or something of value (rice), she must herself become a licensed beautician. Understand that she has the skill and is ready to perform that skill, but in a formal economy skill alone is useless. The process is not that simple, she is told. She needs to prove to the one man that she has been taught this skill, not by her grandmother or mother, but by someone who the one man approved to perform the skill. She needs a licensed beautician to vouch for her skill. The woman believes she understands and arranges to perform her skill before a licensed beautician in the hopes that once this person witnesses her talent, she will be able to braid hair in exchange for rice. No, she is told. It is not that simple. You need to be taught by a licensed beautician. You need to enroll in a school. Pay money to take classes. Once you pass the classes, pay more money to take a certification exam. Pass that exam. Only then will you receive a piece of paper endorsed by the one man to prove you were instructed by a licensed beautician. She is told that school costs many thousands of Ghana Cedis and she cannot just take one course in hair braiding to obtain certification. She has to take a package of courses that included shampooing and conditioning, marketing, entrepreneurship—a whole liberal arts package of courses that will take one year to complete. To her dismay, she cannot braid hair in exchange for money or rice for at least one whole year. And after that process is completed, she must renew her beautician’s license every two years or else lose her certification. Then she is told that even after she receives her license, she cannot braid hair from her home. In the one-man-eats economy, that is simply not permitted. She will have to build another structure that is used solely for the business. That structure will cost another thousands of Ghana Cedis. But if it’s simpler, she is told, after she has completed schooling and obtained certification, she can submit an application to braid hair at that one man’s shop—he owns most of the businesses in the formal economy—his is a certified business. If her application is good enough for his liking, if she is fortunate and he finds her worthy, if he likes her enough, she can work for him. He will give her permission to braid hair in exchange for money and rice. He will allow her to work to eat. She will be one of the lucky ones. As always, there is a catch. Now the woman in the formal economy is indebted to the one man. She owes him for school fees, for certification, for a home and a car if he gives her a loan. She is in debt for years, if not her whole lifetime, when in the beginning all she needed was a bag of rice. The woman in the informal economy has a constant flow of rice with constant heads to braid—no monetary investment necessary. Her skill is sufficient. Simple enough. By now, it appears the logical decision for any human being would be to choose life in an informal economy over life in a formal economy. Why go through ten steps to eat rice when one can achieve the same end using only one step? Of course, things aren’t always as they seem. Appearances are at once alluring and deceptive. In a formal economy, she is bedazzled by the décor and background music of brick and mortar constructions—proper shops. She pays more for the accouterments than for the essence. She adores even heralds the extras over the substance. The informal economy holds comparably less glamour. Certainly, here a woman is not bedazzled by vendors’ storefronts. She does not visit a store for its ambiance. More likely, she wonders whether the store owners have ever heard of the word ambiance or if they even understood, much less care, about aesthetics. When a woman is famished, eating is all that matters. But once she is full, her appreciation for eating gives way to a penchant for ambiance and aesthetics. She insists, why trivialize these things that are deemed so important, things that are valued today? When every man eats a little but enough, no one hardly notices the dirt roads, the shapeless lawns, the home lacking a fresh coat of paint. When one man and a few chosen others eat too much, the roads become untarred, the lawns unkempt, the house dilapidated—all maladies to be remedied by the one man’s elaborate new developments. As it stands, the choice is between a one-man-eats-winner-fancies-all economy and many-win-a-mere-sum-every-man-eats economy. If societies could achieve a balance between the two poles, one might call that civilization. Though a mighty undertaking looms ahead for he who ventures to share the one man’s cheese. Previous articleYou Don’t Become a God Until You Rest in Peace – Muhammad Ali is a God. While westerners berate Africa’s informal economies, Nefetiti suggests, that instead of rolling over into a Formal Economy, we must be more cautious. Perhaps, a balance. But more, an economy that empowers the individual more than the corporation. An economy that empowers the individual and the family more than it does the Company. 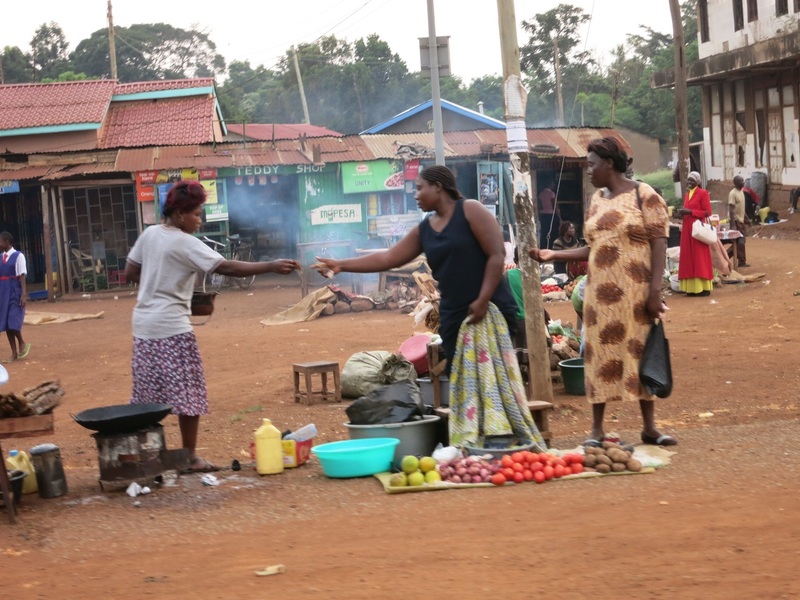 Informal economies, particularly those in Africa, demonstrate a high level of efficiency. The also have the least environmental footprint. It wrecks the least amount of havoc on the environment. Still, they are more stable – less susceptible to the whims and caprices of the corporation. At the very least, the informal sector must be encouraged and maintained. Very interesting. Atiga Jonas Atingdui, I remember you ‘kinda’ alluded to this some time ago with a post about the taxi market in Washington DC versus that in NYC. In DC common people can enter the market without a financial barrier – all they need is a car, pretty much. But in NYC, Philadelphia, and much of the rest of the US the price of a medallion for a taxi business is more than half a million. As corporatism enlarges beyond recognition it fails to understand that the individual is at the center of any economic system. I guess Nefetiti feels that the informal sector serves as a balance to check excessive corporatism! But that is why we have government in the first place! Except government is bought everywhere the world over to serve only the interests of monopolies. In Ghana, any one can bottle water and sell. You drink at your own risk! In the US, you need special permission, that is lots of money. Still you drink the water at your own risk! There seems to be no special benefits to the community accruing from the formal economy! Most formal sectors in Ghana rather extract the wealth out of our dear country. That is why any thinking group of people who become the leaders of their country in Africa can take the world by storm with these African ideas. Such as, an informal sector is necessary to strike the balance needed to prevent corporatism from running excessively awry! Thanks Nefetiti, this is profound. Quite edifying that the author would use African Hair braiding to illustrate her point. For me, this is fascinating because many children from Kumasi and Tamale have been spirited away to the US to slave in Hair Braiding stores of their African Mistresses. The US government has been cracking down on such fronts as I understand it. But the issue further buttresses the authors point! The way forward for Africa can only be rooted in African ideas. I have seen nothing wrong with our informal sectors. I have seen it generate much wealth – unmeasurable and untracked. I feel this is why governments exist. I feel this is why the Statistics Dept. at the Ministry of Finance exists – to quantify and make the case for an Africa-centric business model that will, like the old systems before it, empower the individual, not government, not corporations, not companies, not monopolies but individuals and foster competition. Although some will find some discourse btn the individual and the company. Such as, ‘don’t individuals build companies?’ Yes, only the company cannot become more powerful than the individuals that it comprises. In the US for example, a tiny LLC can pollute the Mississippi River and no individual can be held accountable. In Ghana as well. River Tano is completely polluted by such LLCs. Person-hood for corporations only when it comes to their protection, and no person-hood when it comes to the laws of holding individuals accountable for their actions, is a dangerous idea. Maybe this is one of the implications of this beautiful essay. The essential informal experience of Africa’s economies is marked first by wonder at the utter dependence of all things and the utter independence of the players on the economic scene. Secondly, it is associated with immediate needs – hunger, thirst, danger, migration, failure, poverty, fear, guilt; or with immediate contentment, relief, happiness. Which then morph ingenuity in its stead to the more stupendous realizations of self. Thirdly, it is marked by a love for family, a stillness of the responsibilities that come with it, by illumination, understanding, relief of tension which is otherwise widespread in a corporation today, and simple joy. With this arises the desire for fellowship with others who can help one achieve more happiness. More simple joy. Which brings me to the fourth. Africa’s informal sector, like the Trotro, awakens a heightened perceptiveness and sensitivity to beauty, with new perspectives on the road everyday to and from wherever. Far better than the cold cars on an underground train which are all owned by the same person who owns the Grocery store you are trekking to, which you cannot afford. With new perspectives come a new sense of proportion and a new more selective interest. Africa can build her own economies from this truth, this sincerity and this integrity of mind and honesty of attitude, and for all ethical considerations. Our emotional energy if released in the right amount and in the right places can be channeled into fresh creative and cost effective activity, of both individual and social value. All these characteristics, infolded within the initial experience of the informal economy of Africa-fame, can be increasingly unfolded as economic experience matures. Kudos Nefetiti. You open eyes. My mum is a Makola woman. The economic structure of Makola which is informal is very sophisticated and self organizing. It is high time we study systems like Makola economics and see how we can apply it to our economies in general. We need a new functioning, accountable and responsible Economy. The new Economy will be hinged on Small Business Enterprises (SBE). SBE – business with 1-10 employees or with up to Ghs 2m/year turnover. The hair braiders and coconut sellers all fall under SBE. Under an ARM government, there will be a Minister for Finance, Small Business and De-regulation. This is different from the current Finance Minister who is the Government’s Budget Officer and nominally in-charge of fiscal policy. The fiscal policy manager will be called TREASURER. The Minister for FSBD will build the new economy with Small Business as the fulcrum. Formal Sector – my understanding is that this refers to businesses which are registered with Registrar-General’s department and captured by Internal Revenue Service. Informal – are those not captured as above. Integrated SBE will cater for both. Each State under our Ecofed system will have a Chamber of Commerce with a section for SBEs. Each District in a state (there will be 5) will have a SB Advisory Board.